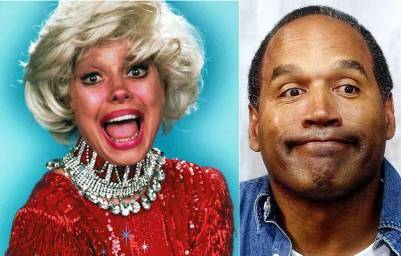 OJ Simpson Is A Robbery Suspect And Carol Channing’s Dress Is Missing. Hmmm….. I wonder of OJ Simpson took it. Looks like the wrongly not-convicted murderer has been up to some more illegal activity lately. Carol has been married four times. Carol’s fourth husband, Harry Kullijian, had been her high school sweetheart. They reunited after she mentioned him in her autobiography, and married on May 10, 2003, when Carol was 82 years old. Carol revealed in her autobiography “Just Lucky, I Guess,” published in 2002, that her father was a light-skinned African American who passed as white. next post: Barry Manilow Hates Elisabeth Hasselbeck. OJ Simpson has a brother named Howard K. Stern. Every time they open their mouths, they lie. Patterns of behavior very similar; it’s all about them.